X-Files’ Gillian Anderson and David Duchovny will most likely never confirm that they are dating or romantically involved. But, these days, the X-Files co-stars do seem to be going to much shorter lengths to try and hide their alleged romance. Long before David Duchovny and wife Tea Leoni divorced, there were whisperings of a romance between him and Anderson, but the stars went above and beyond to hide it. Nowadays, they aren’t leaving much to the imagination. 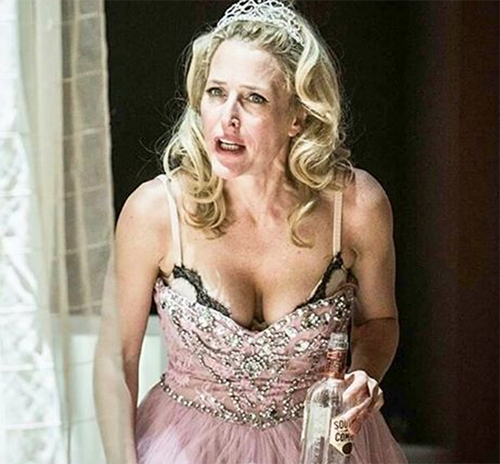 As most X-Files fans are well aware of, Gillian Anderson is currently starring in a play, ‘A Streetcar Named Desire,’ at St. Ann’s Warehouse in Brooklyn, New York. Fans were ecstatic at the Saturday, April 30 showing of Anderson’s place when they recognized a familiar face in the audience – David Duchovny! David attended the showing of ‘A Streetcar Named Desire’ to support his rumored girlfriend and her new acting project. Several fans snapped photos of David Duchovny at St. Ann’s Warehouse in Brooklyn and uploaded them on social media. Attendees at the play reported that David arrived with his sister, and he was glued to the stage during Gillian Anderson’s scenes – he even gave her a standing ovation when the show came to an end and then slipped backstage to hang out with her after the curtains closed. Over the past year, Gillian and David have become much more public about their relationship. Not only have they interacted on social media with each other, but they have been seen in public together on more than once occasion, and Gillian even joked about David’s kissing skills on a recent episode of Watch What Happens Live with Andy Cohen. Honestly, Gillian and David will probably never come right out and say, “Yes, we’re dating.” But, their actions aren’t exactly saying that they aren’t dating these days. What do you guys think? Share your thoughts and theories in the comments below!